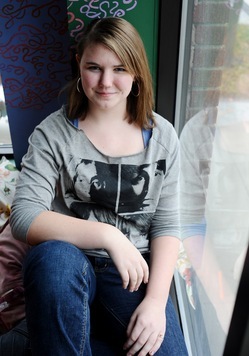 Posted on Tue, Feb 28, 2012 : 5:22 p.m.
Ann Arbor’s Katy Butler, 17, is urging the Motion Picture Association of America to lower its rating on a new film that highlights school bullying. The MPAA gave "Bully," which is set to be released in select theaters March 30, an R-rating for language. The Weinstein Company, the studio behind the film, also attempted to appeal the rating and lower it to “PG-13” based on the movie’s educational merit. But Weinstein was unsuccessful. Butler, a Greenhills School junior who endured harsh name-calling, shoving and tormenting in middle school at Ann Arbor Public Schools, has taken matters into her own hands via a petition on Change.org. More than 89,000 people had signed Butler’s petition as of Tuesday afternoon. Butler said the MPAA’s decision means those people who need to see the movie most — the teens that bully their peers or have suffered violence at the hands of bullies — would not be allowed to see the film. Her plea on Change.org states the MPAA robs teenagers of a chance to help reduce violence in schools. She said with the R-rating, “Bully” could not be screened in middle or high schools across America. This is not Butler’s first anti-bullying petition on Change.org. In the fall of 2011, Butler led an online petition against pending legislation in Michigan called the “blueprint for bullies” and advocating for anti-bullying legislation that doesn’t exclude students targeted for attacks based on sexual orientation. The first petition garnered 56,436 signatures. “Bully,” a documentary by Lee Hirsch, follows five children and their families whose lives have been affected by school bullies. The Weinstein Company is known for making films that push the envelope of what’s acceptable. For more reading on the topic, check out the following column by Gary Susman of The Huffington Post: 'Bully' documentary: Weinstein Company loses appeal over R-rating. To view Butler’s petition, click here. It this movie is important enough for teens to see, then maybe the language should be &quot;beeped&quot; out so it can meet the standards for PG-13. I do not think the efforts of a 17 year old minor, regardless of subject matter, should be dictating what is appropriate for my children. Maybe she should send her petition to the movie makers who have total power to rework the film. Unfortunately, fighting a business vs. the government may not look as good on her college resume. Wed, Feb 29, 2012 : 11:45 a.m.
Any type of instrument that might assist in reducing the bully that is currently happening should be used -- if the R rating is for language, sorry to say it folks, but the kids have all heard it before. If this movie would help just one child to not be bullied, it is worth it. Having said that, we all need to be aware of bullying and to stop it especially in these times when kids use the internet, etc. for their bullying =- so much easier because they don't have to look into the eyes of the individual they are attacking. Wed, Feb 29, 2012 : 4:48 p.m. Yes the language is real...but that doesn't mean it is appropriate to be used and if it's not appropriate than it shouldn't receive a lower rating. That would only mean dropping the standards for all films which is definitely something we don't need. Wed, Feb 29, 2012 : 12:32 a.m. If the reason for the rating was language, would The Weinstein Company consider releasing a &quot;clean&quot; version? I know this was done for the movie, &quot;The King's Speech,&quot; so that educators could use it. I agree, though. This could be a valuable tool to use in classrooms everywhere. Wed, Feb 29, 2012 : 1:06 a.m. It's probably far more realistic the way it is now. Isn't that the point? Tue, Feb 28, 2012 : 11:24 p.m. While an R rating might prevent teachers from taking students on a field trip to see it, or from eventually showing it in their classrooms, it certainly won't stop kids from being able to see it on their own. Tue, Feb 28, 2012 : 11:31 p.m.
Also, there was a 2001 movie called &quot;Bully&quot; that dealt with bullying, it was a fairly successful independent movie. Pretty graphic and disturbing from what I can remember, I think it was either R-rated or unrated. Tue, Feb 28, 2012 : 10:58 p.m. While I understand why it would be great if this movie were able to be viewed in schools, I don't think asking for a lower rating from the MPAA is the solution. According to the Huffington Post article the reason for the R rating is language. From what I've seen it seems that for a movie to receive an R rating only for language then the language must be pretty bad. Maybe the Weinstein Company should edit out some of the language if they really want the rating to be lowered. I've seen many PG-13 movies that fully brought across the point of the film in an appropriate way while still staying true to reality...I have no doubt it could be done with this film. If the MPAA were to allow the rating to be lower based on &quot;educational purposes&quot; that would leave too many openings for other more inappropriate movies to try to get the same done just to get more viewers. Personally I think the rating standards are low enough and shouldn't be changed. I definitely think films like this should be shown to as many as possible, but going to the MPAA about it is not the solution. Also, I've heard of high schools showing rated R movies in the classroom. They got away with it by either sending out permission slips to parents explaining why they wanted to show the film and what in it accounted for the R rating or by physically editing (fast forwarding) the film. Wed, Feb 29, 2012 : 4:46 p.m. I think you would be shocked if you knew my age...but I don't share that information on the internet. Wed, Feb 29, 2012 : 1:05 a.m.